Want to make herbal soap, look first to your garden. No space for a garden, then turn to planting potted herbs. Gardening is a wonderful way to provide supplies you need for making your own beauty products. While essential oils provide strong scent, they do not provide texture and visual interest, as actual herbs do.I generally prefer to use both in my creations whenever possible, especially in homemade scented soaps. I especially like adding dried herbs to melt and pour soap. I find doing so gives the soaps more of a homemade rustic look. No matter what your gardening situation you can always find room for a potted herb. Growing herbs yourself in pots, is easy enough, and there are so many options to select from. Potted herbs can include floral selections or those grown for their scented leaves. When deciding what types of scented herbs you want to use to make herbal soap, consider both fragrance and benefits provided for the skin. These are five types of herbs that are great for making herbal soap and can be easily grown in potted containers. 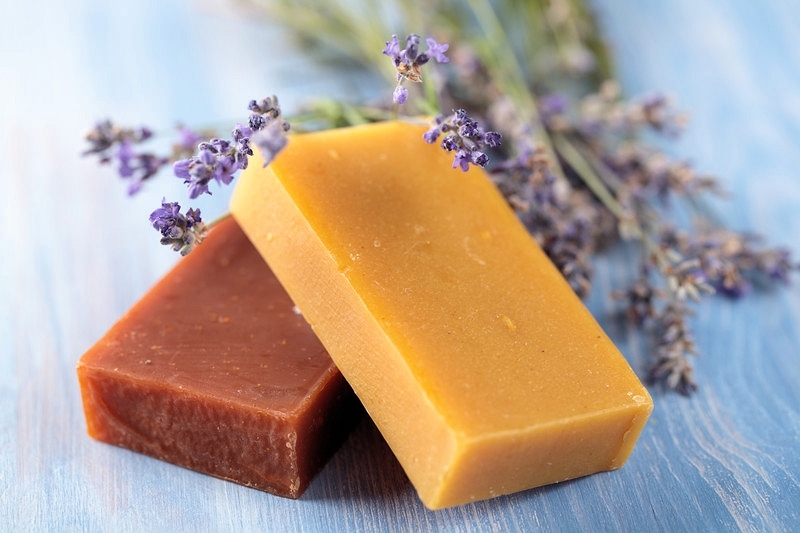 Lavender is one of the most common herbs used to create scented herbal soaps, both because of it’s lovely fragrance, and it’s calming effect after use. I’ve used lavender buds in bath bombs as well as homemade soap. The leaves and buds of the herb are both useful, and they hold up well to the soapmaking process, creating both fragrant and visually interesting bars. 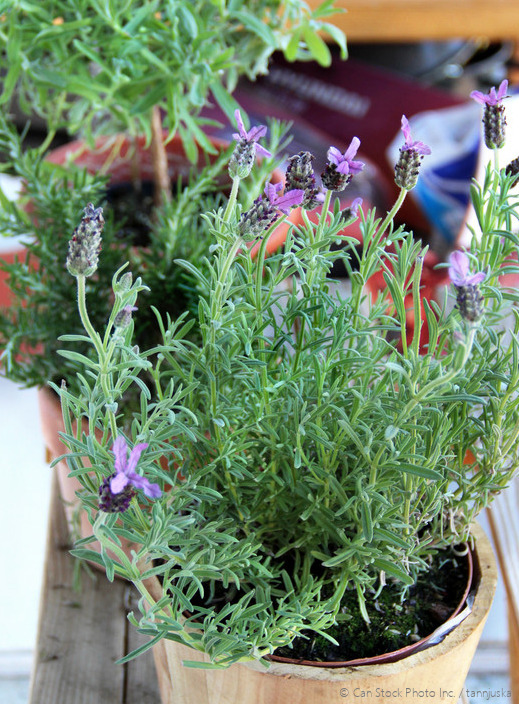 As a potted plant, lavender does well because it likes nutrient poor and undisturbed soil. Add it to a pot that is double the size of its original root ball, do not pack the soil and water two to three times a week, letting the soil dry out completely between waterings. Get Lavender plants and seeds . Calendula, or marigold as it is more commonly known, is an excellent medicinal and fragrant herb to use for making soaps. In addition to naturally tinting the soap a light shade of yellow, many people keep it on hand for chapped or dry skin. The petals of this flower have long been used for healing burns and reducing the pain associated with bug bites. Marigolds, which are primarily used in gardens for their floral colors, but can be added to pots and kept indoors as long as they are given a sunny corner and plenty of water. Add nutrient-rich soil to their pot and flower food one to two times per growing season, watering regularly. Grow some Calendula . Peppermint and any herb in the mint family are best grown as a potted herb unless you are interested in having an entire garden worth. The herb is a prolific spreader and can overtake neighboring plants quickly. Peppermint will continuously produce new branches and segments that can be used for soap-making year round if you keep it in a sunny window during the winter months. Get some Peppermint plants . Sage scented soap is another popular option to make herbal soap with. Sage leaves are loaded with fragrance, so it only takes a small amount to scent a batch of soap. Like lavender, sage is a no fuss herb that does not do well in rich soil, so a mixture of potting soil and sand will produce the best-scented plants. Keep in partial sun, indoors or out, and allow the soil to dry thoroughly between waterings. Order some sage for your pots . Rose scented soap is such a special treat, and so many people do not realize that the rose plant is a herb. Dried rose petals are also lovely to include in romantic bath bombs. Miniature versions of the plant can be potted, and the best variety for this are tea roses, which come in so many colors and are just as fragrant as their full sized cousins. Add plants to a rich, well-balanced soil, with rose food added regularly. It is also important that you keep them in full sun, and water well. The rose buds are the ingredient that you will need for your soap, so collect them before they begin to wither and fall off the branch. Here are some miniature roses for container gardening.